McConnell and his uncle Mario—founder of Big Mario's Pizzeria—at a FareStart event. In addition to cupping coffees—the professional practice of evaluating the flavor profile and aroma of a coffee—Mike McConnell starts his day with a macchiato. Throughout the day, he follows that with shots of espresso (ristretto, no sugar) and at a minimum, two cups of single origin coffee—always black—and finally, a small cold brew. For McConnell, coffee is serious business. As owner of Caffe Vita (among other restaurants, including Via Tribunali and the much-missed French gem Crémant) he has cemented his place in the Seattle coffee landscape by pioneering the Farm Direct movement and sourcing coffee from farmers with sustainable practices; but McConnell also has a long history of giving, an influence that includes his more than two decades worth of work with FareStart. McConnell is no stranger to the organization, but this October, he joins in a one-of-a-kind culinary event series: Caffe Vita Culinary All-Star Guest Chef Nights. This series of evenings include specially prepared meals from star-studded chef match-ups like chefs John Sundstrom and Monica Dimas (Oct. 6), chefs Josh Henderson, Brian Clevenger and Heather Earnhardt (Oct. 20) and chefs Dre Neely, William Belickis and Brendan McGill (Oct. 27)–just some of many of the individuals who have been influenced by McConnell’s work and career. Monica Dimas, another featured star in FareStart's Caffe Vita Culinary series, has been professional friends with McConnell for years. Herewith, we had the chance to chat with McConnell about coffee, his FareStart origins, and what he eats for Sunday lunch. Reservations can made be made for the October Guest Chef Nights at farestart.org/guest-chef-night. 1. Seattle equals coffee. As owner of Caffe Vita, what would you consider to be your place in the Seattle coffee landscape? We don’t spend much time comparing ourselves to other companies. We are focused on doing everything we do better. 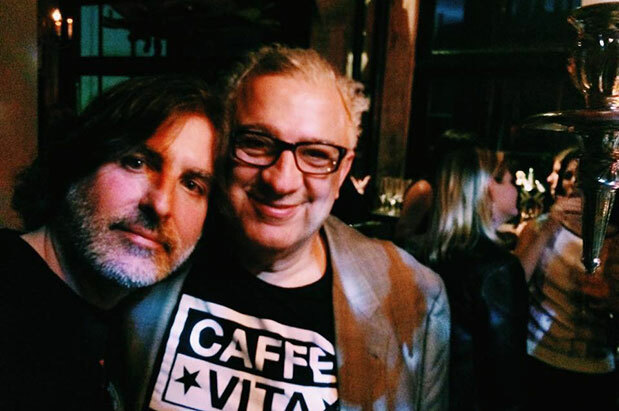 Quality is very important to me and that has always been at the foundation of Caffe Vita. Relationships and giving back to our communities have been a part of our fabric since opening in 1995 and pioneering the Farm Direct coffee movement in 1997. 2. Where did your involvement with FareStart begin? Sometime in the '90s. I learned about FareStart from a couple of regular Vita customers who were involved. Ironically, they were both Starbucks executives. The success stories moved me and continue to do so at every FareStart event. 3. What do you enjoy most about working with Farestart? The opportunity to work with an organization I wholeheartedly believe in and that has such a meaningful impact on our community is fulfilling. Giving [disadvantaged] people hope and opportunity is awesome! 4. How has it influenced you? Witnessing the graduates courageously give speeches and the moment they receive their knife sets are some of the most gratifying moments I have experienced. I remember the 1980s, living on the streets of San Francisco and how alone and hopeless I felt. FareStart gives the homeless hope and community, reminds us that everyone has a unique story and an opportunity to succeed if they are willing to work hard and want it bad enough. 5. What are you most excited about for the All-Star Guest Chef Night? What plans are in the works? It's going to be great seeing all of these great chefs (John Sundstrom, William Belickis, Heather Earnhardt, Brendan McGill, Josh Henderson, Monica Dimas, Brian Clevenger, Dre Neely) working together in the same kitchen. This will be the first time for many of them. It's exciting to think of the impact and influence they could have on the students' lives and their future careers. 6. What have been your most important career moments? Almost 30 years ago, my friend Sedat Uysal (owner of Café Paloma), told me I should start my own coffee company. That is when I first realized my true passion was coffee. A few years later it became a reality. Thank you, Sedat! 7. What do you love about the Seattle food scene? I love that many of the people who make up this scene serve Vita coffee! I appreciate the authenticity of many restaurants and their dedication to quality and sustainability. We are spoiled here in the Northwest. 8. How has it felt being a mentor to so many chefs? It's an honor for me to call so many great chefs friends. I may have been asked for advice from time to time, but they did all of the hard work. Mentoring and watching friends become successful is a great feeling (trust me). 9. What advice would you give to aspiring chefs and restaurateurs? •Listen. Only take advice from people who are where you want to be. •Learn from other people's mistakes. •Be authentic. Don't pretend to love rock music when you listen to rap. •Prepare yourself (and your family) to be temporarily broke, working seven days a week morning to night. •Focus on quality, never cut corners. 10. You’ve got your hand in pizza, coffee, and French cuisine. What’s your favorite thing to make in the kitchen? I love cooking anything with my wife. Sunday lunches are my favorite (we make a mean Sunday Gravy and lasagna Bolognese). One of my favorite dishes to cook this time of year is “Fresh Pappardelle Pasta with Locally-Raised Rabbit Ragu" and a nice bottle of Josetta Saffirio Barolo. 11. Where did your culinary journey begin? Sometime in the '90s. I was influenced heavily by iconic Seattle restaurateurs and close friends Peter Lamb and Carmine Smeraldo (Queen City Grill, il Terrazzo Carmine). 12. What do you plan to do in the future? What are your career plans? Spend more time eating and drinking great bottles of wine with family and close friends. These days, I don't think much about career plans. For now, I am enjoying working with and developing a team of smart, young people to lead our businesses into the future.